On their trip to Stockholm for writer Joe Castleman (Jonathan Pryce) to receive a Nobel Prize for literature, long suffering wife Joan Castleman (Glenn Close) re-examines the nature of their marriage. Joan’s resentments of the sacrifices she has made over the decades to forward her husband’s career bubble to the surface, as an even bigger secret threatens to undo all they have worked upon. 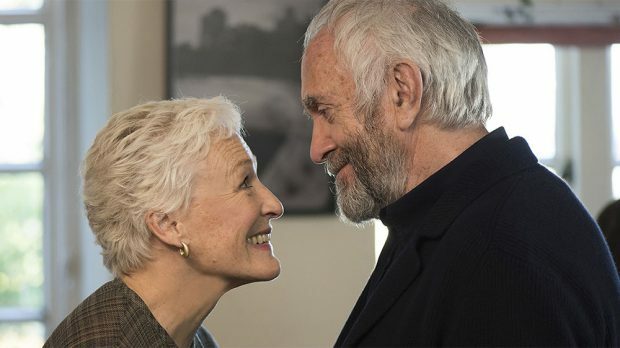 Based on the 2003 best seller of the same name, a combination of brilliant story and acting make The Wife one of the best character studies of this year. Close is phenomenal in the role, providing us with the nuance of the character. It is a contained performance, often reliant on subtle facial gestures that convey a wave of repressed resentment and sorrow. Close allows us to feel both the building resentment of Joan and the myriad of conflicting emotions arising from that, slamming against her perceived sense of duty and strongly internalised stoicism. By contrast Pryce is allowed to bring a character that is larger than life to the screen, occasionally imbuing him with humanity and brief glimpses of the his flaws and insecurities. Easily dismissed as a braggart, Pryce grants Joe a more complex portrayal than just the bluster of the character. Together they are the ego (Joan’s quiet behind the scenes work to maintain normality) and the id (Joe’s various overwhelming appetites) brought into one relationship. As such, from the outside, what seems a solid and stable relationship is riddled with lies and on the verge of collapse. The various secrets underlying this are the fodder for the drama of The Wife, which despite its world stage, often plays like a theatrical drama. However the big screen enables something more. That ability for the camera to close in on a reaction, allowing audiences to capture every emotion and nuance of expression that the actor is experiencing, is used to marked effect here. Indeed at times, it is often overwhelming, and we wish to escape from the agonies that Close’s character is trying to hide, but instead are confronted with them, filling our vision. Led by the two principal actors and backed by a solid cast at the top of their game (Max Irons, Christian Slater, Annie Starke, Karin Franz Körlof) The Wife delivers a riveting personal drama, allowing for a rich exploration of character motivation.